It’s say to safe that one thing that we all deal with is stress. The struggle is real, guys. Between working 40-plus hours a week, finding time to squeeze in exercise, making an effort to eat healthy, and trying to have some semblance of a social life, the daily grind can be overwhelming. And the resulting stress can totally wreak havoc on your life (hello, acne and sleepless nights)—especially if you don’t have tools like yoga, CBD oil, or meditation at your disposal to help you manage it. There’s another modality specifically designed to help you cope with stress, and you may not have heard of it yet: MBSR. What is MBSR, you might wonder? Short for Mindfulness-Based Stress Reduction, it’s an eight-week live mindfulness program founded by Jon Kabat-Zinn in 1979. 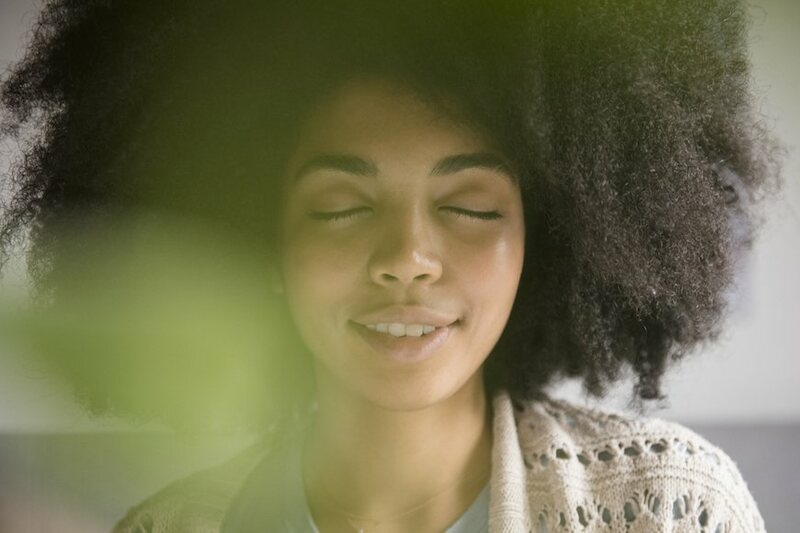 Think of it as meditation therapy that’s all about bringing your awareness to the present moment, says Elisha Goldstein, PhD, co-founder of The Center for Mindful Living in West Los Angeles and creator of A Course in Mindful Living. Originally, MBSR was created to help people with chronic illnesses learn how to relate to pain differently, and thus decrease their stress and suffering. It has since been adapted for people who deal with stress of any kind—be it anxiety, relationship struggles, or emotional pain. Here, Dr. Goldstein dives deep to share what MBSR is all about, the benefits of it, what to expect from the course, and a few easy mindfulness exercises you can start practicing ASAP. So how does MBSR work? In other words, when we stress out about being stressed out and try running away from it, the result is just that even more stress is created, effectively just making us feel way worse. It’s a vicious cycle. MBSR helps people break that cycle by teaching them how to see stress and pain in a different light, which, in turn, decreases the suffering. MBSR teaches you how to harness your mind and control your stress. And when you feel like you have control over it, that makes you feel better and more resilient, which gives you the mental energy to focus on the things that make you happy. This is especially pertinent for people who deal with chronic illnesses. Dr. Goldstein says we’re programmed to hate pain and try to move away from it, but when we do that, it adds another layer of stress to the body, which only enhances the illness and makes recovery more difficult. The solution? Acceptance. If you just let it be and allow yourself to be more present and become aware that you have a choice in how you view and react to the pain, the pain fluctuates rather than remaining chronic, Dr. Goldstein says. He sums it by saying that MBSR teaches you how to harness your mind and control your stress. And when you feel like you have control over it, that makes you feel better and more resilient, which gives you the mental energy to focus on the things that make you happy. What are the benefits of MBSR? Obviously, the number-one benefit of MBSR is stress reduction (duh, it’s in the name). But, that benefit is nothing to scoff about—it’s a huge one. Can you imagine blissfully skipping through life without stress weighing you down? Amazing. So how exactly does MBSR make your stress melt away? The program has been shown to help grow new neural connections in the hippocampus, the part of the brain that’s involved with learning and memory, Dr. Goldstein says. Activity is also shifted to the part of your brain where positive emotions live, hence why you feel happier and less stressed. MBSR classes typically meet for 2.5-hour weekly sessions over the course of eight weeks. The program also includes a daylong retreat. There are thousands of MBSR teachers all over the country, so a quick Google search can help you find a local class. Although it was ideally designed to be taken in person, Dr. Goldstein says there are some online versions you can take too. Each week, you’ll learn both formal and informal mindfulness practices to implement into your life. Formal practices, Dr. Goldstein says, are exercises that that require you to carve out some time to complete (usually 30-45 minutes a day). Alternatively, informal practices don’t require any extra time, because they can be easily sprinkled into your day. There’s also a discussion and inquiry portion of the program, during which the teacher is available to help participants understand the practice and nurture their awareness, Dr. Goldstein says. And because the course is taught in a group setting, students can take advantage of learning from one another as well. And although eight weeks is solid chunk of time for being able to internalize the practice and integrate it into daily life, Dr. Goldstein says MBSR is really just an introductory program to mindful living. You can dive way deeper and take your mindfulness to the next level with other courses. And just like with anything else, the longer you do it, the better equipped you’ll be to create a sustainable practice, and the more you’ll be able to reap the results. Start to dip your toes into mindfulness with the beginner’s mind exercise, which tasks you with noticing something as if it’s the first time you’ve ever seen it, Dr. Goldstein says. Imagine you just landed on Earth from outer space. How would you look at, say, a raisin, for the very first time? Really pay attention to the object of your attention with intention and a sense of curiosity while engaging all of your senses. You’ll notice things you never had before and grow a newfound appreciation for them, Dr. Goldstein says. Bringing this heightened awareness to the items and things we do every single day can be pretty profound. Simple things like eating, walking, showering, or washing dishes can seem downright magical. This ritual is one of the first formal meditation practices you’ll learn in MBSR, Dr. Goldstein says. The purpose of the body scan exercise, he explains, is to ground yourself in your body and train your mind to be more present. Depending on how much time you have available, you can do it for 3 to 10 minutes. Begin by sitting or lying down, closing your eyes, and bringing awareness to your body. Start with your feet and notice any sensations with curiosity. Then shift your attention to your legs. Continue to slowly move all the way up to the top of your head, stopping at every body part and giving it your full attention for a few moments. End by bringing your attention back to your breath. Sending good vibes to yourself and others is a good idea, and that’s exactly what the lovingkindness meditation practice is all about. To do it, Dr. Goldstein recommends closing your eyes and taking a few deep breaths. Imagine someone you love is sitting in front of you looking into your eyes. Put your hand over your chest to help you connect with your heart and cultivate those warm and fuzzy feelings of love. Continue taking deep breaths and reconnecting with your heart. Then repeat the process, this time sending lovingkindness toward yourself. Then repeat the process again with someone you don’t know very well, like the woman who makes your smoothie after spin class every week, for example, and again with someone who is currently frustrating or annoying you. Close out the mindfulness ritual by extending your lovingkindness to the entire world and wishing everyone happiness, health, and safety. And lastly, take a moment to mentally thank the people you envisioned during your practice. The STOP practice (which stands for stop, take a breath, observe, and proceed) is a short and sweet two-to-three-minute practice you can sprinkle throughout your day whenever you need a little reset. “It’s like a mini meditation,” Dr. Goldstein says. The STOP practice (which stands for stop, take a breath, observe, and proceed) is a short and sweet two-to-three-minute mini meditation you can sprinkle throughout your day whenever you need a little reset. Just stop whatever you’re doing. Get comfy in whatever position you’re in and take a few deep breaths. Observe what you’re experiencing in the moment. Scan your body for any sensations. Pay attention to any emotions you’re feeling. And check in with your mind too. Is it distracted or focused on the future or the past? Whatever the case, bring your awareness back into the moment. The last step is to determine what is important right now to pay attention to as you proceed with your day. The work is just being present and allowing and noticing the unfolding of life. Then focus your awareness on any sensations you’re feeling within this vast open sky. Let those sensations be and notice them come and go. Next, focus on thoughts. The work is just being present and allowing and noticing the unfolding of life, Dr. Goldstein says. Finally, narrow your attention back to your breath. In the market for other healing practices? Try qigong meditation or these yoga moves that feel like a massage.